I’m willing to grant Steve Carell a mulligan on this one as long as he agrees to my demands: take an extended vacation, film some more episodes of The Office, and then come back in a year or two with something amazing. With Get Smart due out shortly I already know he did not listen to me, but hopefully he will heed this advice in short order. The reason I suggest this is because his career path is starting to look all too familiar. He is chasing the big money (not that I blame him) and throwing caution to the wind when choosing scripts. Now more than ever he needs to exercise caution with his projects before he goes the route of Will Ferrell-esque overexposure. It’s usually not a good sign when the best thing I can say about a film is that it’s “cute” and “family friendly”. That wouldn’t be such a bad description if I was talking about Finding Nemo, but I strongly doubt it’s what Carell intended. 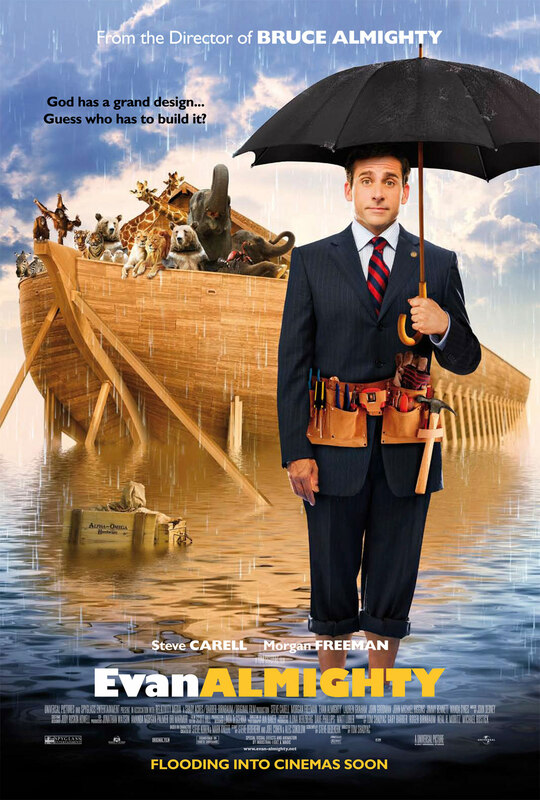 In what amounts to one of the flimsiest sequels ever to be spun from its original, Evan Almighty squeaks by on the merits of Carell and very few entertaining scenes by bit players. Evan Baxter, the gibberish-talking anchor from Bruce Almighty, gets appointed as a Congressman and heads to Washington, DC, and with family in tow sets off in an effort to “change the world”. Wanda Sykes plays the comedic relief role as his Washington aid, and she is hit or miss with all the one-liners. I suspect some people find her funny as she couldn’t have toured as a comedian to empty venues for that long. Another surprise is Jonah Hill as the way-too-eager-to-please Eugene, an intern to Baxter’s office. Why does he somehow manage to play creepy dudes in most of his roles? His stalker-resort worker role in Forgetting Sarah Marshall was essentially reincarnated from his turn here as Eugene. The only thing missing was his typical stoner-humor in this PG affair. What a shocker that he was unable to evoke even a chuckle without the ability to drop a dozen f-bombs in 30 seconds. As in Bruce, Evan is approached by God (aka Morgan Freeman) with a mission to carry out – build an ark to save humanity and His creatures from the pending flood. To make matters worse, Freeman decides to mock his disciple by turning him into a Moses look-alike which causes Evan’s peers on Capitol Hill to decide that he has lost it. In the background is John Goodman as vindictive Congressman Long. He attempts to take advantage of Evan’s naivety as a freshman Congressman in order to push through a bogus bill which will benefit him financially. Don’t ask for much more detail about Long’s intentions as that is about as deep as the story wishes to go. What I don’t get is how the story paints Evan as a do-gooder from the beginning with bold intentions. As we remember from Bruce, he was nothing more than a glory-hungry newsman looking for his big break. Apparently somewhere along the line he found a conscience and wanted to help society. Yet, the writers still attempt to portray him as a goofball who makes innocent mistakes. It is here where the story truly failed. Ultimately, it is only Evan who trusts Freeman and carries out his duty. There are zero surprises throughout the film and the ending is predictable even if you never read the Bible. Somehow the writers managed to call this a sequel and build upon a bit character in the first one, even thought that meant altering him altogether. I think that Hollywood has found the formula for the ultimate plug n’ play story. Who cares if one has nothing to do with the other? Interesting Cameo Appearance: Ed Helms (Former correspondent on The Daily Show and current character Andy Bernard on the hit comedy The Office) as a TV reporter covering Evan’s Ark-building project. Joan Baxter: You want to build a boat? Evan Baxter: It might be something fun for the family. Go sailing on the lake. I don’t know. Evan Baxter: If that’s true, I’m going to be so pissed. Eugene: I love you!… I mean, I think we should hang out socially… I have a new ping pong table. Rita: Why do you sound like Evan Baxter but look like a Bee Gee? Evan Baxter: I can’t shave. Whenever I shave it just grows back! Marty: That’s what happens when you shave. But then you shave again! I was wondering if this was an extension of the characted from Bruce Almighty. It’s a pretty thin premise to have that characted get his own movie but with Steve Carell blowing up I guess the producers felt this was justification enough.